Google never fails to show its popularity. In the fourth quarter of 2018, it had been accounted for being 96 percent organic search visits by US mobile users. Almost 26 percent of the searches in the last quarter of 2018 were organic, which is a half-point less from that of the third quarter of the year. The data revealed about the fourth quarter of 2018 by Merkle’s Digital Media Report also has figures related to paid searches, social and other ads. In the last quarter, organic searches are mostly less because brands are more inclined towards paid posts. There has been an increase of almost 2 percent in organic site visits in the last quarter, over the years. 24 percent site visits through organic searched are by mobile devices. On desktop computers, there has been a decline of 10 percent in organic searches whereas, organic search through mobile phones has been 17 percent on average. Also Read: Why Do People Click on Google and Search Ads? In the fourth quarter of 2018, 93 percent of all the searches in the US are through Google, which was 92 percent a year earlier. 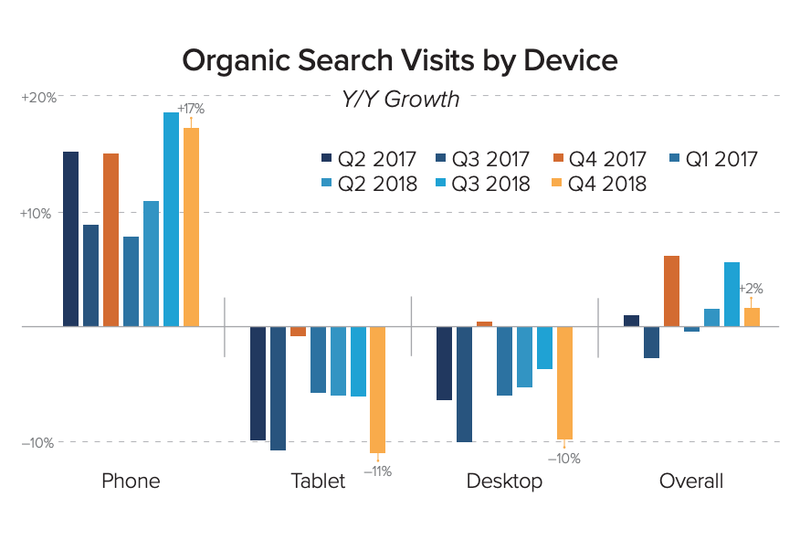 Google organic search visits through mobile phones have been around 61 percent in the Q4 2018. Overall Google organic search grew 3 percent, and on mobile devices, it has increased to 12 percent. 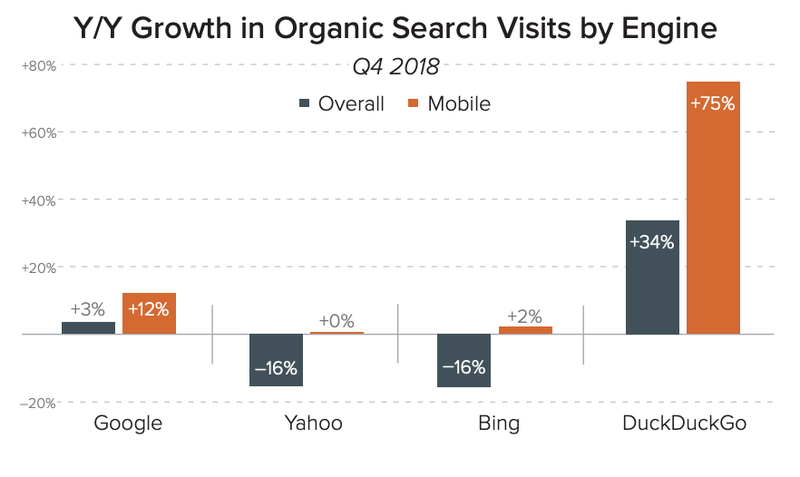 Bing has 4 percent total organic search visits from the US in Q4 2018, whereas through mobiles, it has been 2 percent only, making a decline of 16 percent year-over-year. Though in mobile searches, an increase of 2 percent can be noticed for Bing. 0.4 percent of organic search visits are in favor of DuckDuckGo in Q4 2018. On mobile, it has been 0.5 percent of the organic search visits. 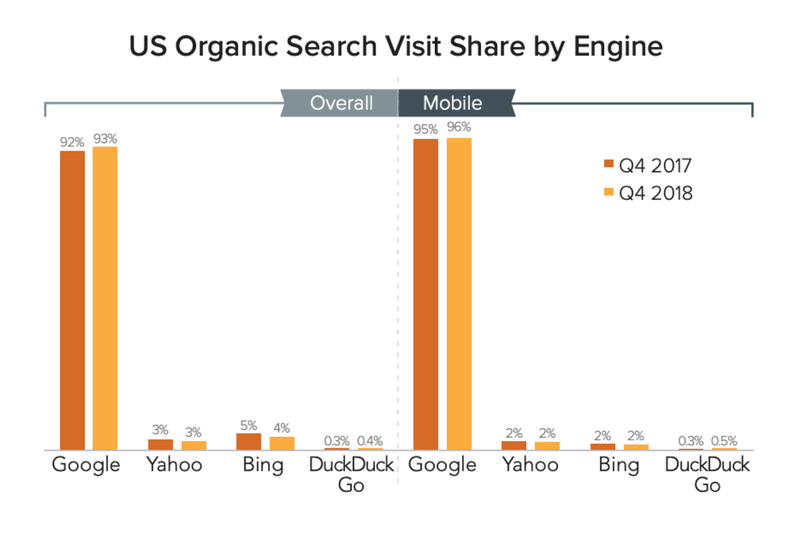 In Q4 2018, DuckDuckGo has an overall 34 percent organic search visits and has been increased to 75 percent on mobile phones. Other details about the search, social media and overall digital marketing space are also available on the report.